▲ An dre, the chairperson of the GSC is reading the letter from students for cleaning staff and guards on campus. On May 10th, 4:00 P.M., the General Student Council held an appreciation banquet for cleaning staff and guards on campus at Haklim Auditorium. 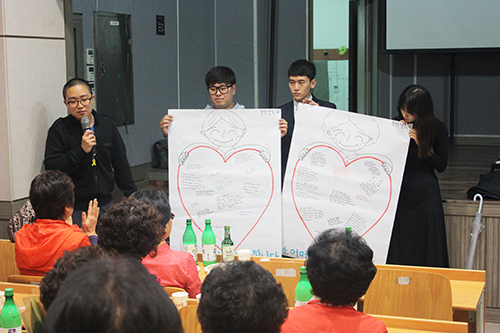 Students from the GSC and student councils of each college attended and had time to present flowers and written messages to express gratitudes on behalf of Donggukians.